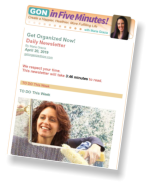 You Get 5 FREE Organizing Goodies STUFFED with TONS of Creative Ways to Help You Organize Your Home, Your Family, and Your Life! 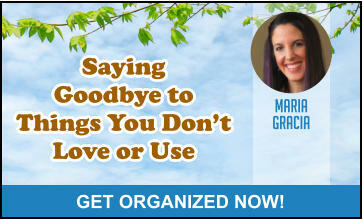 GON = Get Organized Now! Join Over 20 Million Fans! 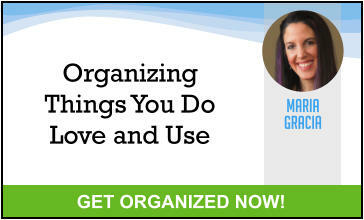 Since 1997, Organizing Expert, Maria Gracia, and her Get Organized Now! (GON) business has been having a positive impact on the lives of over 20 million people around the world via articles, media interviews, speeches, books, website, social media, and especially from her GON in Five Minutes! 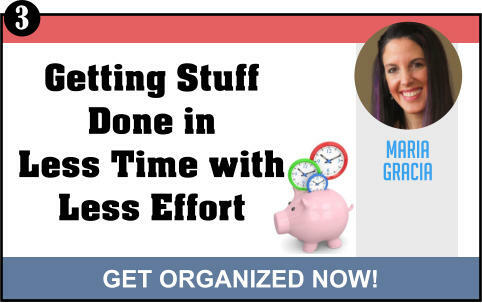 Newsletter Maria’s GON in Five Minutes Newsletter is included too - FREE! 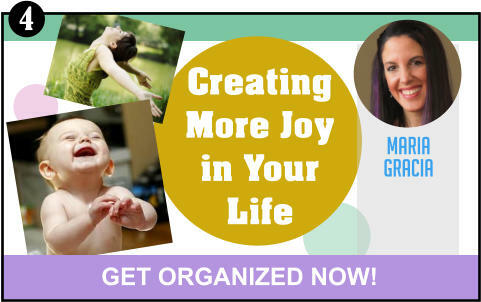 It’s unlike any other organizing newsletter available today. It literally changes readers’ lives for the better -- in just 5 minutes a day, or less. 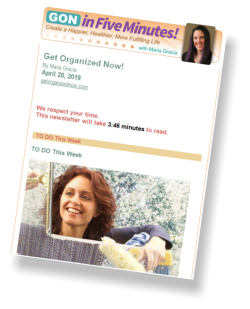 It uses the scientific principle of Repetitive Reminders, stories, vivid examples and real life Reader Tips to help change your attitude and thinking, and, most importantly, your organizing habits -- in just 5 minutes a day or less! You’ll Get Instant Access to: 1. Saying Goodbye to Things You Don’t Love or Use 2. 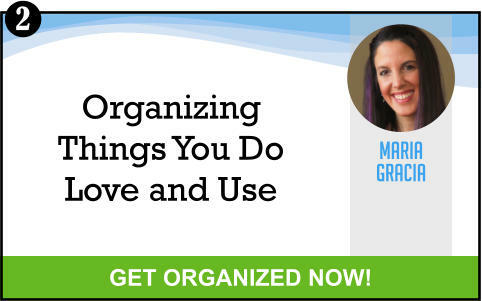 Organizing Things You Do Love and Use 3. 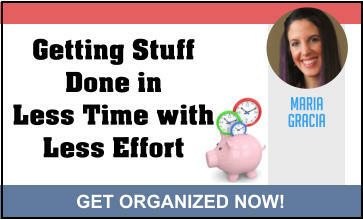 Getting Stuff Done in Less Time with Less Effort 4. 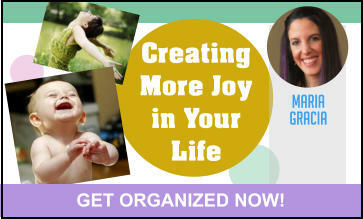 Creating More Joy in Your Life 5. Your First Issue of Maria’s GON in Five Minutes! 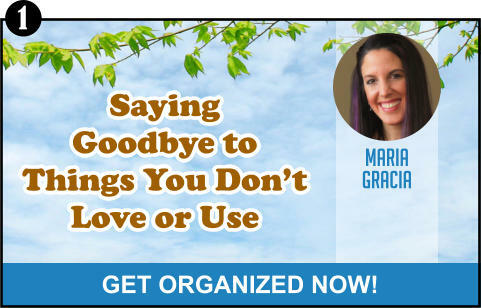 Newsletter (You can easily unsubscribe at any time.) ALL . . . FREE! You’ll join 20 million people whose lives have been positively impacted by Maria’s unique approach to organizing in her GON in Five Minutes! Newsletter (See the description to the right and the words of her raving fans of GON in Five Minutes! below. It’s all FREE: Your Privacy is Protected by Our No-Spam Policy. You’ll join 20 million people whose lives have been positively impacted by Maria’s unique approach to organizing in her GON in Five Minutes! Newsletter (See the description and the words of her raving fans of GON in Five Minutes! below.